I ended up with a bit of free time on my hands last summer, and then a very dear friend pointed me in the direction of fantasy-horror-sci-fi mash up, Supernatural. Suddenly, I had no time on my hands for anything else, including eating, sleeping or functioning as a human being. The show follows two brothers, Sam and Dean Winchester, in their fight to….fight. Every season there’s something new to battle – yellow-eyed demons, the forces of hell, the forces of heaven, and the apocalypse season by season, and episode by episode a plethora of straight up ghosts, vengeful spirits, demons, wendigos, slenderman parodies, fairies, angels, leprechauns, witches, vampires, werewolves, prophets and goodness knows what else. Quite frankly, as well as being completely addictive, it’s fun. There are vampire-hunting episodes where the bloodsuckers have started imitating Twilight to lure in their victims. There’s an episode where the main characters are thrown into this world and the lives of Jensen Ackles and Jared Padalecki rather than Sam and Dean. Episodes feature slow dancing aliens and crocodiles in the sewers, they feature deadly bad luck charms, they feature gods and angels and monsters and demons and it’s fantastic. 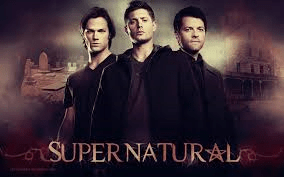 Posted in Arts and tagged review, supernatural, TV. Bookmark the permalink.